Sterling BillBand Company has been a manufacturer and supplier of quality paper bill bands since 1996. Our billbands are excellent quality, made from 50# brown kraft paper and designed to withstand repeated handling. Our customers come back to us for repeat orders because our bill bands are made from quality materials. Our customers come from a wide range of industries. While we supply our bill bands to banks and financial institutions, money bill bands are also used by other industries such as restaurants and food services, retail establishments, state and federal organizations and more. 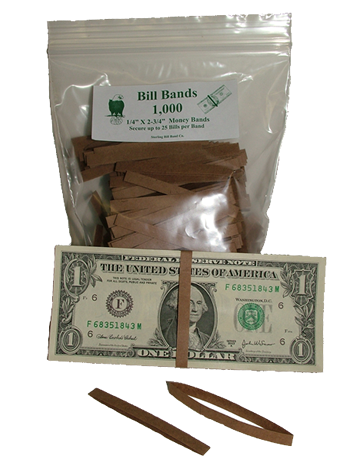 Our paper bill band products are an inexpensive and efficient way to better handle and organize paper money. We offer various lot sizes with free shipping for quantities of over 20 units. We are a family owned and operated company. Our factory and warehouse are located in West Boylston, MA and our office is located in Sterling, MA. 100% Customer Satisfaction is our #1 Priority. Sterling BillBand Company will never share or sell your information to another party. We will only use your information to process your order or request for information.